When we walked out of Ishqiya (a play on ishq/love and a certain Hindi swear (c---iya)?) last night, a group of well-heeled young folk passed us. Posh Girl loudly declared, "I wish they had used subtitles so that I could actually understand what they were saying!" Indeed, Ishqiya tests even the nativest of Hindi speakers, as its characters speak almost entirely in thick Bhojpuri dialect, peppered with some adult language which unfailingly yoked hoots and howls from the audience. The movie, which carries Vishal Bhardwaj's stamp of production approval as well as his musical director tastes, feels much like, well, a Vishal Bharadwaj film, only Lite. That is, it is indie, arty, grimy and fun. At times, it feels like a bromantic curry Western in the style of Sholay. At times, it feels like there's a mariachi band right around the corner. With a heavy disclaimer that we speak only elementary school-level Hindi and hence don't understand rated-R Bhojpuri slang, we think the story was about two buddies, Babban (Arshad Warsi) and Khalu (Naseeruddin Shah). These low-level goondas steal X million rupees from their feather-voiced boss, Mushtaq (Salman Shahid), and hustle away through deepest, dodgiest Uttar Pradesh. Eventually, they find refuge in the home of the beautiful widow Krishna (Vidya Balan). While there, Khalu overhears Krishna busting out some glorious sitar beats at dawn and, immediately smitten, he speedily dyes his beard with henna and begins the courtship dance. Krishna seems to return the affection, mostly because it's hard to hurt someone as soft and fuzzy as Naseeruddin Shah in Love. Meanwhile, Babban is also smitten with Krishna - though his affections are of the more, er, carnal sort. So Khalu's the classical romanticism of ishq and Babban is the more MTV libido-driven lustiness of *ahem*-iya. And meanwhile meanwhile, the trio plot an elaborate kidnapping plot of the local political leader. Maybe "quirky" is the best word to describe this film, as it doesn't fit into the usual Hindi film mode of using bubblegum star power to propel things forward. There are no item numbers and no big stars. Even Vishal Bharadwaj's other films - Maqbool, Omkara, Kaminey - featured bankable heroes like Irrfan Khan, Ajay Devgan and Shahid Kapoor. It was refreshing to see a film comfortable enough in its premise to cast an older actor and a relatively less-famous star as the two buddies. Ah, how long it's been since Naseeruddin Shah had a more meaty, non-supporting role! It really took us back, man. Which reminds us: another refreshing thing was the absence of any heavy-duty "Social Themes" which marred many a 1980s Parallel film (including many of Naseer's!). 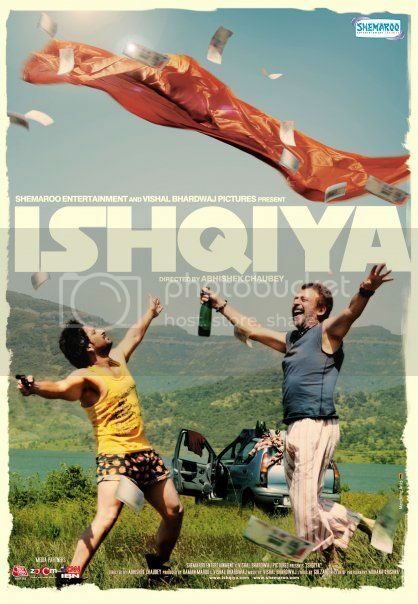 Ishqiya instead is part of the new new wave of indie Hindi films - movies which are smart without being somber, alternative without being obtuse. We are very, very pleased with these films. "mostly because it's hard to hurt someone as soft and fuzzy as Naseeruddin Shah in Love" I completely agree. However while you were too busy being charmed by Naseeruddin jaan, maybe I remind you that the gorgeous Vidya Balan was also in the movie!!!! Overall I loved it, amazing music, cinematography, dialog (although hard to understand at times) and superb performances by everyone involved especially Arshad Warsi who is one of the most under-rated actors in the industry. Amazing music...very Raj Kapoor.And in the vernacular dialect you really really need to live in those rustic parts to get the inside jokes.Wish we had more of these and less hammy SRK. I love it when movies pick a dialect and stick to it. It makes me think that the makers really wanted my attention rather than hoping that I would give it a look see for the pretty pictures in between making out with my boyfriend and chowing down on my popcorn. Just another reason to love Ishqiya. But yes, you should get the DVD with subtitles when it comes out because there's a lot of interesting stuff going on in it!